Just when I think I’ve seen every Firestorm-related RPG item, a gem like this turns up! While doing research for the new DC RPG: THE HERO POINTS PODCAST (you do know about the new podcast, right? ), Siskoid informed me that for many years Dragon Magazine featured a one-page “Daily Planet Gaming Supplement” for the DC Heroes RPG. I had no idea! Turns out there was a Firestorm entry in 1988!!! How cool is this?!?! Click below to enlarge. What fascinates me about this entry is that its focused on the “Blank Slate” Firestorm! Hooray! Essentially Mayfair took the stats for the classic Firestorm (first edition RPG rules, as that was the only edition at the time), and made some minor alterations to accommodate the new incarnation. See below a breakdown of the major changes from the classic Nuclear Man. Miscellaneous Limitation: A third personality controls the Firestorm body, rather than Ronnie or Mikhail. Minor Irrational Attraction: Confusion about the world. This is to represent the “blank slate” nature of the new Firestorm personality. It’s worded strangely, but I understand the spirit of the item. Lowered Intelligence by 2 ratings, to represent the loss of Professor Stein. Added Starbolt power. This is probably just a correction as it should have been included with the original Firestorm. Finally, added Bio-Energy Blast power, limited to contact with the ground to create miniature exploding volcanoes. This was a power Firestorm inherited from Pozhar (as demonstrated below). 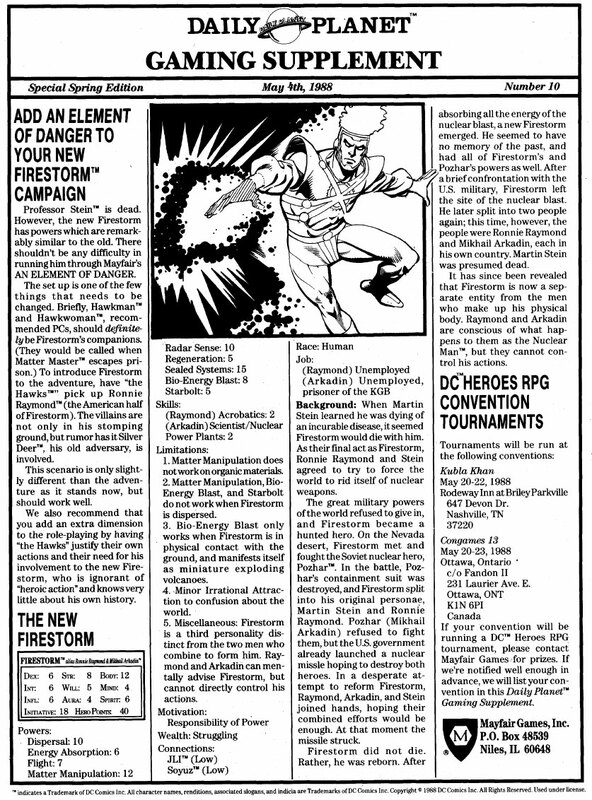 I’m thrilled to find the “Blank Slate” Firestorm getting some respect in the RPG! 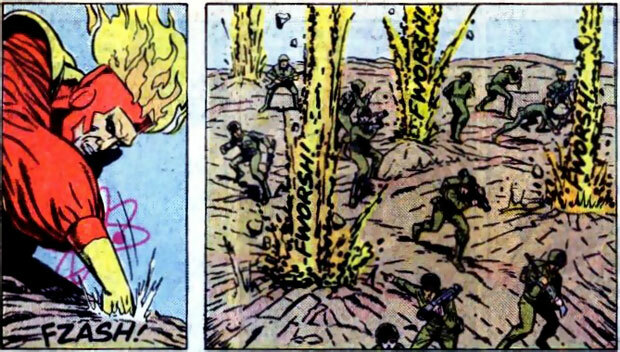 Years later Mayfair published a Who’s Who companion for 2nd edition which indicated the classic and “Blank Slate” versions of Firestorm had identical abilities. So not true!!! That never sat well with me. This version above accounts for the differences pretty well. For other Firestorm stats, please see below. Classic Firestorm [1st & 2nd edition stats]: includes erroneous statement that the classic and “Blank Slate” Firestorm had identical abilities and powers. Elemental Firestorm [2nd edition stats]: includes three different versions of his stats. Support Firestorm (and DC Comics Role-playing Games)! Fan the flame! Posted in: Firestorm #02: Blank Slate (Ron/Mikhail/Stein), Firestorm comic vol. II, Mikhail Arkadin/Pozhar, Ronnie Raymond, RPGs. ← Go read JLA #7.2: KILLER FROST in stores today! Wow, I never knew Dragon even covered the DC RPG! And I used to flip through my friend’s copies way back when…dunno how I missed it. The DC and Marvel Philes were the only reason I looked at the magazine, really.